Richard Watson Dixon was an English poet and Wesleyan minister of the 19th century. 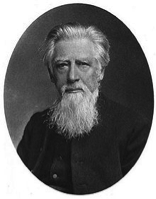 He was born on the 5th May 1833 in the London borough of Islington, the son of a notable Wesleyan preacher of the time called Dr James Dixon. His parents sent him to be educated at King Edward’s School, Birmingham, whose headmaster was the eminent Anglican minister Dr Gifford. From here he studied at two Oxford colleges – Pembroke and Exeter – and it was at the latter where he formed a close brotherhood with a number of other students who all shared a love of divinity, art and literature. Their artistic leanings were evidenced in a series of frescoes, showing scenes from the Arthurian Romances, that were painted on the walls of the debating hall at the Oxford Union. Dixon read the Classics while at Oxford and graduated with a BA in 1857. His association did not end there though as, the following year, he won a prize for an essay on the subject of The Close of the Tenth Century of the Christian Era. He followed this with a very impressive poem about St. John in Patmos which gained him Oxford’s Sacred Poem Prize in 1863. This was two years after his first collection of poetry was published under the title Christ’s Company. A second collection came out in 1863 called Historical Odes. Literary critics have compared these early efforts of Dixon to eccentric writings coming out of the Pre-Raphaelite school. It would be natural to assume that his first collection was strictly religious in tone but, in fact, they owed less to his strong devotional feelings and more to the writer’s picturesque imagination. His second collection has been much admired, with excellent pieces included such as odes to two famous English dukes Marlborough and Wellington. Between 1858 and 1863 Dixon was the curate at two London churches, the first one being in Lambeth and the second in Newington Butts. During the next five years he had quite a change of scene, moving to the north west of England to take up, first, a school master’s post at Carlisle High School and, secondly, a minor canon and librarian post at Carlisle Cathedral. He remained in the county of Cumbria for eight more years, serving as a country vicar before moving to another ministry, this time at Warkworth, in Northumberland. He stayed in this region for the rest of his days. Rather than take it easy, as his friends hoped he would be able to, Dixon took on the daunting project of writing a church history. The first volume of this appeared in 1877 and he continued this writing whenever he could find the time, around his busy tasks as a clergyman. By 1891 he had become the examining chaplain to the Bishop of Newcastle. Dixon achieved much in his church life but accepted all the accolades with modesty and he was delighted when his university conferred upon him an honorary doctorate in divinity. Sadly this occurred during the last year of his life. His standing in the literary world almost won him the coveted position of Poet Laureate on the death of Alfred, Lord Tennyson in 1892 but he missed out on the final selection. Following a severe bout of influenza Richard Watson Dixon died on the 3rd January 1900, at the age of 66.